For many years, there has been talk about “Paperless” office solutions. However, very few organisations have been able to achieve this. With information coming from different sources it can be difficult to access the information you need to produce your documents. 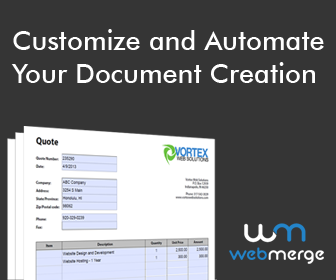 Whether you are an environmentally friendly advocate or you’re interested in simplifying your documentation administrative tasks, Webmerge allows a streamlined approach to document generation and delivery. Webmerge is an online platform that allows you to easily collect data, populate a document and then save or send it to any contact automatically. The platform provides you with the flexibility of common document types (such as PDF and Microsoft Office documents), dynamic content and delivery options that fit to your business needs. Webmerge can be used as a standalone product or integrated with other business products like Salesforce Sales Cloud, Sign Now, Eventbrite or even Facebook. To see all of the integrations that are possible, click on Webmerge link and choose integrations. Security – You have full control over how your data is delivered. Webmerge does not save any information that is sent for merging. If your documents require higher security you can download directly from the website and not send via email. There’s also the ability to lock PDF’s with a password. Take a new employee’s details once and be able to send documents pertaining to Job acceptance, terms and conditions etc. Send a new contractor agreement at the click of a button for each new job instead of manually typing out a new contract every time. If you create templated documents and especially if you gather data for these documents from another online application or data store, then why not reduce your administrative effort? Primary cloud is an authorised Webmerge Consulting partner. Along with our experience in process automation, we’ve had extensive experience with document automation. If you are after that professional look and delivery to your clients, Primary Cloud can deliver. For further information on Webmerge or to sign up for a free trial, click on the Webmerge banner below.